H2No vs Gore-Tex Technology: Which One Is Better? Fabric technologies have been around for decades now, with Gore-Tex being one of the earliest options to have been created. Considered to be the staple of the fabric technology industry, we have, for weeks now, been comparing Gore-Tex to other waterproof and breathable membranes, in order to get to know the options available and ultimately decide which ones are the best. So far we have looked at a variety of not only fabric technologies, but fabric binding technologies too, such as OutDry. 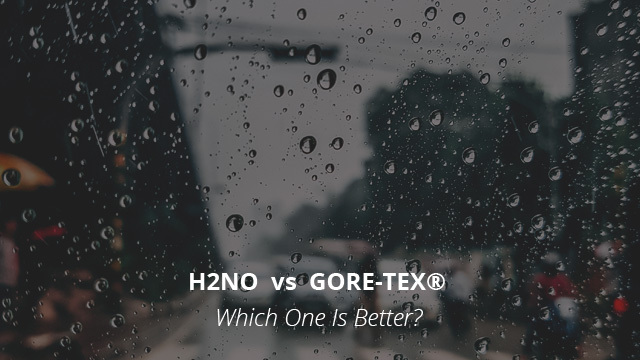 Today it’s time for another comparison, that between H2No and Gore-Tex. First let’s get to know each one a little better and then dive right into the differences and how they compare to each other. H2No fabrics are created by Patagonia, a brand founded in 1973 in California. We have previously gone through several of Patagonia jackets, some of them made of H2No fabric. 2-layer H2No fabrics – completely water and windproof, these two layers are the aforementioned one, the waterproof membrane and the water-repellent shell. The membrane is also highly breathable and there is also a wicking hanging liner, which helps reduce clamminess by making it easier for moisture to escape the jacket. These fabrics have next-to-skin comfort and are very comfortable, as well as quite warm. 2.5 – layer H2No fabrics – the lightest of the three options, these fabrics are also waterproof, windproof and breathable. Made to be practical, they are packable and suitable to take with you anywhere. There is a printed interior pattern, which protects the waterproof membrane and helps distribute moisture in order to reduce surface tension and decrease the risk of water seeping through. 3-layer H2No fabrics – extremely durable, apart from being fully windproof, waterproof and breathable, the 3-layer construction uses a laminated scrim which helps disperse the water vapor build-up by reducing drying time and minimizing the risk of water leaking through. Apart from that, it also helps from abrasions by maximizing the durability and tear-resistance of the fabric. Before we move onto the testing process for these fabrics, the use of DWR bears mentioning. Patagonia uses Deluge® DWR coating, which lasts considerably longer than other standard DWR finishes. Because it works so well, there is no need for fully waterproof barriers to be used in the case of soft shells jackets by the brand, which means a higher level of breathability as compared to other membranes. For the testing process, since it’s the first time we go so in-depth with H2No fabrics, Patagonia uses a 24 Killer Wash testing process, which runs the fabrics through the worst conditions possible, by thrashing it around vigorously and then moving on to water permeability testing. After both these tests are passed, the H2No Performance Standard status is given to the fabrics, guaranteeing that they are the best of the best. Gore-Tex® is a brand name which was given to the company in the 1970s, which itself was founded in 1959. Roughly a decade later, the founders’ son created ePTFE, a material that was then patented by the company and found use in many different industries, outdoor clothing being one of them. ePTFE is a highly durable material, with very low water adsorption abilities and billions of micro pores on its surface. These pores are the reason for the breathability of the Gore-Tex fabrics, which are capable of wicking moisture away, while at the same time preventing water droplets from getting through. Membrane – due to the high numbers of micro pores that are able of wicking moisture. Laminate – because the ePTFE is bonded between two fabric layers. Technology – it comes in different variants that are used for several purposes, some more breathable, while others more durable. Pro – breathable and durable, designed for agility activities such as hiking. PackLite – the lightest option, suitable for more casual wear. Pro Shell – this is the most durable and weatherproof of the options, mainly used in gloves and shoes. Active – the go-to fabrics used by athletes and outdoor enthusiasts as this is the most breathable option. Judging solely by waterproof ratings, H2No fabrics fall between the 10.000 – 20.000 mm range, which is considered highly waterproof, as the minimal rating required is 1.000mm and above. The higher the better, of course. Gore-Tex’s water column rating begins at 28.000mm and goes upwards of that, making it considerably more resistant to water than H2No, and it is no surprise as barely any other fabric technology beats Gore-Tex in this regard. We should note, however, that Gore-Tex, just like H2No fabrics, has DWR coating on the outer layer, which downgrades over time and needs more frequent maintenance than the H2No. 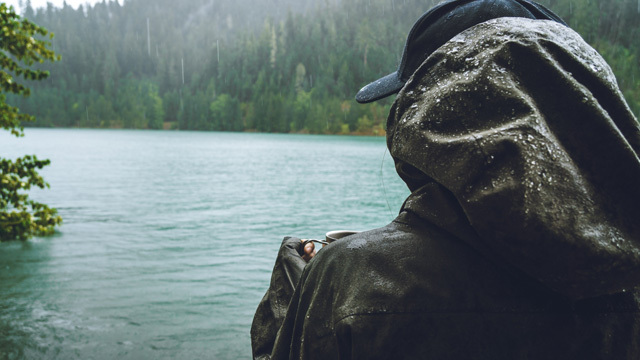 Lastly, waterproof rating of a jacket does not necessarily indicate how well it will perform in bad weather, as the construction of the jacket itself is very important. While such high water column ratings as we saw above are considered to be highly waterproof, a jacket that has low quality seam-proofing will eventually let water through. Sealed or taped seams are the best options if you want to be certain that you will remain safe from the elements. This is the part that makes the difference in terms of wear, as it ultimately determines how much you will sweat in your jacket. The breathability ratings for each are around 15.000 – 25.000 g/m2/24h for Gore-Tex and 12.000 – 15.000 for the H2No fabrics. As you can see, Gore-Tex is the most breathable out of the two, and so far only eVent fabrics have managed to outdo Gore-Tex in terms of breathability. Durability-wise, nothing beats Gore-Tex, because the ePTFE membrane is extremely resistant to abrasions, wear and tear. These fabrics are one of the few that will last for many years without any sign of damage. H2No are also very durable, but unfortunately they do not come close to Gore-Tex in this case. As for wear, Gore-Tex jackets tend to be a bit stiff, due to the ePTFE, so they are not the most comfortable option available. This is where H2No fabrics perform better than Gore-Tex ones. All things considered, once again the answer is Gore-Tex. However, considering the high price of Gore-Tex jackets and the purpose for the jacket you are looking to buy, a H2No jacket will keep you dry and protected in harsh conditions, albeit not as long as Gore-Tex would. There is no need to spend so much money if you want a casual, everyday jacket, rather than a high-performance once. If you don’t spend most of your time outdoors in harsh weather, then H2No jackets offer great quality for value. And now i know y. But feel that the hrs out in the woods Photographing landscapes, ski racing. and working as a carpenter through the winter out side,much of the time. The abrasion resistance of the 3 layerH2No will last a few yrs. We will see. I work in a North Face Gortex jacket with a hood, abrasiion resistant, very good & lasts for about 3 to 5 hrs. In the rain by its self and with a marmonth zip pit rain jacket its good for the day no zipl pits on the north face but the rain jacket vents do balance out the system.